Main Street banks believe they've been unfairly swept up by the tsunami of regulation triggered by the 2008 Wall Street meltdown. But President-elect Donald Trump and his allies have signaled a desire to reverse rules that are seen as burdensome for community banks, freeing them up to give more loans. 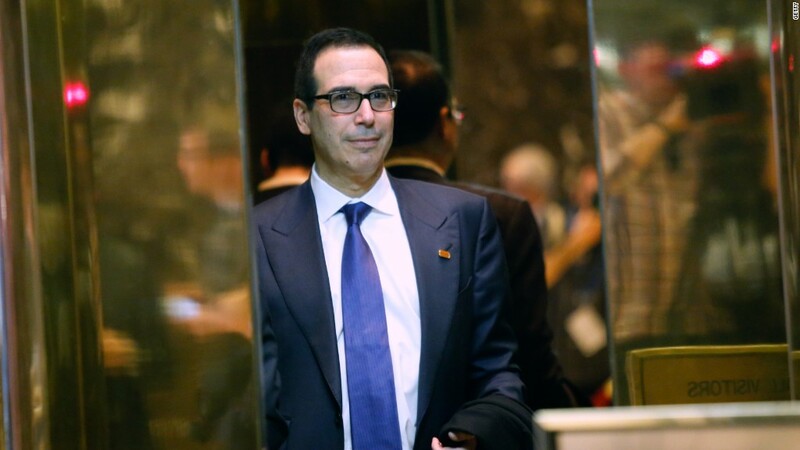 Steve Mnuchin, Trump's pick to lead the Treasury Department, told CNBC last week the new administration's No. 1 regulatory priority will be to "strip back parts of Dodd-Frank that prevent banks from lending." Mnuchin specifically mentioned regional banks as the "engine of growth to small and medium-sized businesses." The post-crisis environment has been particularly difficult for Main Street banks. Not only are these small banks more exposed to the pain of low interest rates, but they have less room to pay for extra compliance costs compared to the mega banks like Citigroup (C) and Bank of America (BAC) that were at the core of the crisis and the downturn. Research from the Minneapolis Fed shows that one-third of small banks would be unprofitable if forced to hire even an extra two compliance workers. Some Main Street banks have been forced to merge just to survive. "We don't have the complexity -- nor the resources -- to meet the new regulations, which are extremely sophisticated," said Nancy Graves, CEO of Bancorp of New Jersey (BKJ), a Fort Lee, NJ lender with nine branches. "Much of the cause of the recession did not have to do with community banks. For us to be painted with the same regulatory brush is unfair," said Graves, who served as a state bank regulator before becoming a bank exec. To be fair, it wasn't just Wall Street banks that imploded during the crisis. In fact, small banks took part in the real estate bubble as much as the big banks, even though they didn't threaten the global financial system with their bad loans. FDIC data shows that between 2008 and the end of 2010, more than 320 banks failed, including many smaller lenders. Dodd-Frank does come down harder on larger banks. Big banks with more than $250 billion in assets face far more scrutiny than Main Street lenders. Banks like JPMorgan Chase (JPM) and Wells Fargo (WFC) have been hit by even more regulation because their failures would threaten the entire system. But Hal Scott, director of a Wall Street-funded nonprofit called the Committee on Capital Markets, complained that Dodd-Frank "lumps in all other banks" beneath that "super level" of regulation. Scott, a Harvard Law School professor, said there is "growing consensus that the regulatory burden should be relieved for small community banks." Dodd-Frank on its death bed? So does this mean the sweeping Dodd-Frank financial reform is going away completely? Even though Trump's transition website calls Dodd-Frank a "sprawling and complex piece of legislation" that he will "dismantle," few expect such a drastic outcome. A financial overhaul would be more likely, some expect. "The conversation has evolved from repealing, to dismantling, to something even less than that," said Cliff Stanford, a former assistant general counsel advising on banking regulation at the Atlanta Fed. "It's more about reforming the existing law to tailor the rules to better suit business models," said Stanford, a partner at law firm Alston & Bird who advises both big and small banks. Graves, the NJ bank CEO, said she's "hopeful" that regulators in the Trump administration will slow down the implementation of rules that have been written to evaluate the costs and benefits. Robert Shapiro, who has advised the Obama and Clinton administrations, too is in the camp that believes Dodd-Frank isn't going away completely. "That may be the dream of Jamie Dimon, but it's not going to come to be," said Shapiro. "Am I surprised that banks want less regulation or that large banks have encouraged the small ones to complain? No. This is business as usual," said Shapiro, a senior fellow at Georgetown's McDonough School of Business. In any case, there's already movement in Congress to give the non-mega banks relief. The House of Representatives is considering a new bill that would let most regional banks drop the systemically-important designation that puts them under extra regulatory scrutiny. The bill calls for replacing the $50 billion asset size threshold with a focus on how complex the bank is. Even though it may not pass this year, Cowen & Co. analyst Jaret Seiberg said the bill "sets the stage for regional banks to get significant relief next year" when the GOP controls Congress and the White House. Ted Peters, a former bank executive who now chairs a hedge fund that solely invests in community banks, said "everybody envisions the regulatory environment actually getting better for banks." "That's has never happened in my 38 years in banking," said Peters, chairman of Bluestone Financial Institutions Fund. Of course, all of this raises the question: Could the deregulatory shift of the Trump administration be forgetting the lesson of the last crisis? "The regulations didn't come out of a vacuum," said Shapiro. "They came out of a period in which financial institutions, including commercial banks and mortgage lenders, secured profits in a way that exposed the rest of the economy to the worst crisis in 80 years."